Technical hybrid mid-layer hooded fleece jacket. 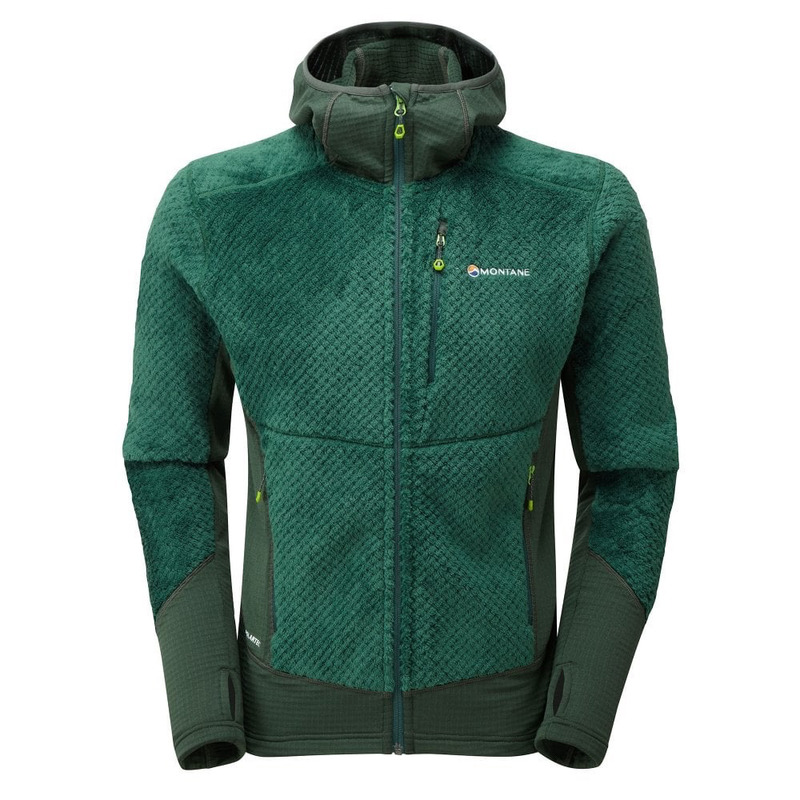 The Wolf Hoodie is a reincarnation of Montane popular Wolf Jacket and is designed for use during high-output stop-start activities when thermal body regulation is required. The Wolf Hoodie features the incredibly soft, yet warm and lightweight POLARTEC® Thermal Hi-Loft fleece in the main body which traps heat for warmth yet moves moisture quickly. It is zoned with POLARTEC® Power Grid™ in the side and underarm panels to ensure unrestricted freedom of movement and comfort. The Wolf Hoodie provides exceptional comfort and warmth when climbing, mountaineering, and hiking in cold conditions and is a perfect layering piece within cold weather clothing systems. Constructed from POLARTEC® Thermal Pro Hi-Loft® fleece whose directional fibres provide outstanding warmth to weight ratio. Stretch POLARTEC® Power Grid™ fleece is used in the side and underarm panels to aid fit. Close fit stretch lycra bound hood can be used underneath a helmet. One mesh lined chest pocket for additional storage and venting. Two vented hand pockets lined with a fine microfleece mesh and positioned clear of a backpack hip belt or climbing harness. Full length YKK reverse coil front zip. Brushed microfleece chinguard on inner collar placket next to mouth and chin. Thumb loops on cuff to prevent lower arms riding up when climbing. Low profile cuffs that can be pulled up forearms to aid cooling.